noun: 1. 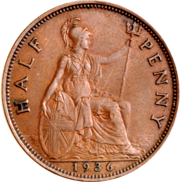 A British coin representing half a penny. 2. A sum of half a penny. adjective: 1. Worth half a penny. From Middle English halfpeny, from Old English h(e)alf + penig, penning. Earliest documented use: 1330. Gerald Parshall; The Diplomatists: Powell & Schwarzkopf; US News & World Report (Washington, DC); Mar 16, 1998. See more usage examples of halfpenny in Vocabulary.com’s dictionary.